UPDATE: Microsoft has removed this feature for reasons best known to them. However, there is a built-in system level font size changer in Windows 10 which you can use to change the font size in Sticky Notes. Refer to our how to change the text size in Windows 10 guide for directions. Sticky Notes program was first offered with Windows Vista. 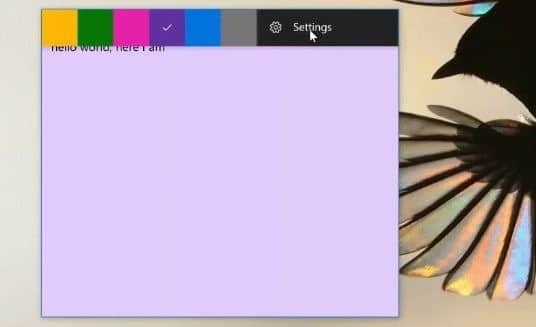 Since then, Sticky Notes program has been part of every version of Windows operating system, including the latest Windows 10. With Windows 10 Anniversary Update (1607), Microsoft replaced the classic desktop Sticky Notes program with Sticky Notes app. Although the built-in Sticky Notes is fairly popular among PC users, Microsoft never offered easy ways to change the default font, font size, and other ways to customize notes. We could use keyboard shortcuts to change the font size and customize notes in the classic Sticky Notes program, but all these keyboard shortcuts do not work with the modern Sticky Notes app in Windows 10 Anniversary Update and above versions. It seems that Microsoft has listened to feedback and decided to offer a few settings to customize notes in Sticky Notes. Microsoft has updated the Sticky Notes app to add more features and options to the app. The Sticky Notes app now supports adjusting the default font size used in Sticky Notes app. Starting with Sticky Notes version number 2.1.3.0, you can increase or reduce the font size with ease without using keyboard shortcuts. In addition to the font size changer, version 2.1.3.0 also brings in a new color picker. You must be running Windows 10 build 17083 or later to get version 2.1.3.0 of Sticky Notes. Here is how to change the font size in Sticky Notes in Windows 10. Step 1: Open the Sticky Notes app. Step 2: Click the three dots on the title bar of the app to see the settings. Click settings. Step 3: Move the font size slider to adjust the font size. Move it to the left to reduce the font size and move the slider to the right to increase the font size. You can see the live preview of the new font size on the same page. Set the slider to your desired font size and leave it there to save the setting. That’s it! We now expect to see an option to change the default font in the Sticky Notes app. You might also like to read our how to recover deleted Sticky notes in Windows 10 guide. Did anyone find the FONT CHANGE on the 3 dots. My sticky notes for WINDOWS 10 doesn’t have that option either. This is silly. We need some help! Here it is Nov 13, 2018 and I still do not have a way to change the font size. I have some difficulty with my vision and do not want to turn on the Magnification stuff for seeing impaired, as it upsets other issues with my system. I pay a monthly fee to use MS Office and think this is more than a small oversight on their part. ***** COME ON Microsoft….. call the man…… just call the man! We need you Bill! It is absolutely stupid that they removed this feature in the current version of Sticky Notes (v 3.0.118.0)!!! I hope they bring it back. I also already reported this to Windows via Feedback Hub already. I don’t have the option to change font when I click on the three dots. Is this option available in a specific version of Windows 10 only?